Starting with a pair of new examinations of Siqueiros' long ago radical mural and his landscape painting, some of the most stimulating shows to open the new season in Los Angeles don't so much celebrate the street, its ecology and its denizens, as appropriate it. Ruben Ochoa continues to turn construction site action into art, Deborah Aschheim mulls over the meaning of modernist architecture now that the jet age has surrendered its starring role in our culture to our own American Taliban. Our editors and writers regard these and other shows this week among the best and most characteristic representatives of what artists are doing today. 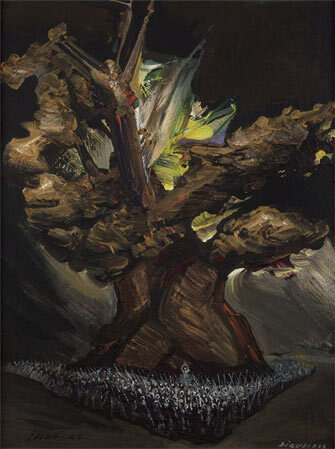 David Alfaro Siqueiros, "El árbol de la noche triste, Estudio para mi mural de Chapultepec, octubre de 1962 / Sad Night Tree, Study for Chapultepec Mural, October 1962," 1962, acrylic on masonite, 23 5/8 x 17 11/16". David Alfaro Siqueiros' anti-imperialist mural, "América Tropical," spray-painted on the upper side-wall of Italian Hall and partially visible from Olvera Street in downtown L.A., was whitewashed shortly after it went up in 1932. But like the stain of a crime, the mural's insurgent colors infiltrated through the overlying layer, so adding to its already burdened imagery a metaphor for cross-border seepage. Over the years, its botched defacement intensified rather than muted its accusatory power. According to Judy Baca, the mural commissioned by the Plaza Art Center was supposed to depict a kitschy Mexican village scene and serve as a backdrop for a Bavarian beer garden owned by F. K. Ferenz, whom the Americanism Committee of the American Legion later identified as a Nazi sympathizer. Instead, over a period of just under two months, Siqueiros and a team of assistants created an 80-foot-wide image which focused on a crucified figure. The mural depicts a scene set in a Central American jungle encroaching upon Mayan ruins. In the center, in front of a decaying temple, a figure depends from a cross under the wings of an American eagle. See complete David Alfaro Siqueiros article. . . .
Nancy Jackson, "Untitled (large mobile)," 2010, paper, styrofoam, aluminum, plastic, papier màché,rnwire, monofilament, thread, glass, 22' high x 60" diameter. Nancy Jackson's current show splinters in two directions. In her narrative works on paper, detailed drawings and paintings come off as quirky, cutting and humorous. The surprise, however is the multi-part mobiles that hang from the ceiling in the main gallery. White cutouts of flowery, geometric and ornate shapes dangle from one another, spanning the distance from floor to ceiling. These obsessively fantastical and intricate works are both seductive and charming. 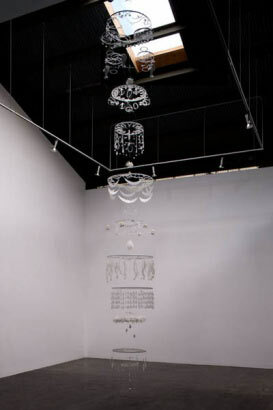 Each piece resembles a chain of an ornate chandelier (made from light materials) that has been taken apart, stripped of the original context, and fashioned together to become more than the sum of its parts. Debroah Ascheim, "Capitol Records (I See Again in Memory Like a Dream)," 2010. Deborah Aschheim manages to evoke both systematic and romantic characteristics simultaneously in a series of drawings and sculptures. 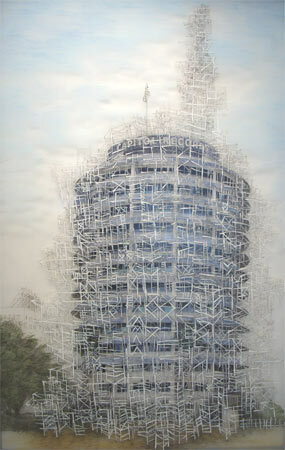 "Nostalgia for the Future" initially draws the visitor into the space with an impressive part imagined, part realistic depiction of a Capitol Records building enveloped in a barrage of metaphorical scaffolding that clings and attaches to the iconic structure the way groupies hang onto a rock star. The sensibility of the lines read not as a representation of the building but more like infused memories. Aschheim describes this and other buildings represented here as self portraits because their age mimics her own. But more than that, the buildings seem to represent the Modern era. The artist appears to appreciate those symbols of the recent past with a curiosity that does not honor but visually wonders and is perhaps saddened by their eventual fading relevance as supreme examples of architecture. The imagined scaffolding continues in Aschheim's sculptures, where the small, plastic, and thin cylinder objects resemble a web that reflects light, draws attention to the architecture and protectively surrounds the iconic LAX theme restaurant. As the scaffolding surrounds the most essential elements of the structure it evokes connections to security, age, and preciousness. The buildings themselves are not more than interesting studies. It is the combination of imaginative structures with real world architectural monuments and symbols that allows the art truly shine and function to full effect (Edward Cella Art + Architecture, Miracle Mile). 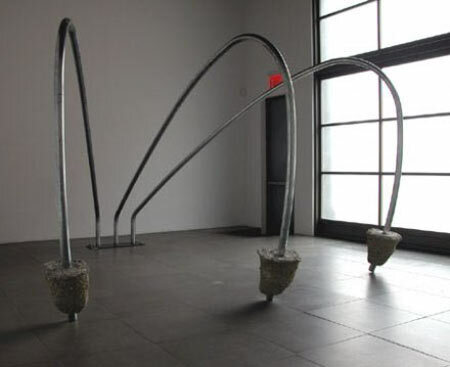 Ruben Ochoa, "three the hard way," 2009, galvanized fence poles, concrete foot postings, steel plate, nuts and bolts, 84 x 144 x 180". For Ruben Ochoa's show, "Grounded," the ficus tree roots that have played a key role in past works have become more implied, and less present: they're only there in spirit. Upon seeing his 2007 show of distended sidewalk sections and cement trees with rebar roots exposed - along with accompanying photos of gnarled ficus roots aggressively reconfiguring their respective sidewalks - I could never look at subsequent tree-root/cement interactions out on the street, without thinking of Ochoa's gesture. "Grounded" follows up on "At First Blush," from earlier this year, in which long-legged rebar creatures sport shipping palette bodies. He continues to anthropomorphize our urban landscape: cement masses arch into turtle shells, with rebar prongs running across the top. Each of the hilly cast mounds is large enough to accommodate a sleeping bear under its earthen roof. Whiskery remnants of roots can be seen dangling down. They're very quietly whimsical, distancing themselves just far enough from minimalism so as to allow for a touch of emotion. In a second room, "Study for ... that's what she said" energizes the space, acting like a galvanized rainbow struck by lightning, concrete feet set askew by the shock. It's a smart piece, but not nearly as memorable as "Grounded." Finally, the office holds a table-like work, balanced on what could be read as a triple reference in concrete to the object of Janet Jackson's wardrobe malfunction. While Ochoa continues to work with basic building materials of the type he has previously employed to fabricate critiques of class boundaries and demarcations in urban life, he has become more aware of using the gallery's expanded space to his advantage, edging towards environmental concerns, and having more fun as confidence and interest in his work continues to grow (Susanne Vielmetter Projects, Culver City). Carlee Fernandez, "Hues from Brown to Pink," 2010, c-print, 24 x 20". In her latest works, Carlee Fernandez sources her own body, the body of her infant son and taxidermic animals into evocative sculptures and photographs. In "World According to Xavier" she explores the "shapes of motherhood and mortality." Her son Xavier is present in both the video and photographic pieces, strapped to his mother in "Hues from Brown to Pink" and wrapped in striped fabric and a plaster cast in Fernandez's "Undulating Form" videos. The juxtaposition of new life and animals devoid of life at first glance and can be shocking. But Fernandez explores the form and interrelationships in the taxidermied animals, pushing them into evocative sculptures that delight in their new life. 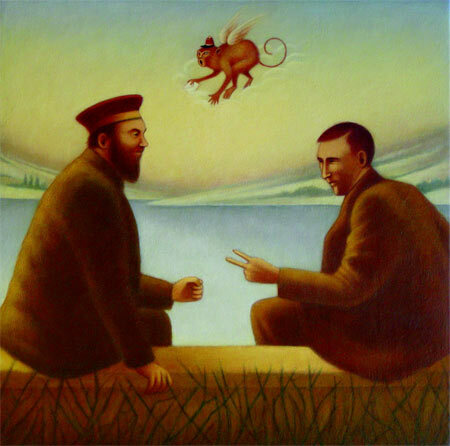 Dana DeKalb, "Passing Impasse," 2010, acrylic on canvas, 18 x 18". A retablo is a devotional painting, generally associated with church traditions and Latin American folk art. The ritual object provides the title of Bay-Area painter Dana DeKalb's current show, as well as names one of the triptychs in it. The spirit is pure and direct, and it ends up being all flinty Americana, even given that quoting multicultural and historical, at times deeply historical precedent occurs purposefully throughout the body of work. Such matters as Greek mythology, explicitly quoted in "Calling Shore" and "Actaeon," may no longer be an essential part of a classical education, but the stories are ripe for a contemporary reinterpretation in DeKalb's aesthetic universe (Sue Greenwood Fine Art, Laguna Beach, California). See complete Dana DeKalb article. . . .